Home » Do you own EMS? Get more out of it! Do you own EMS? Get more out of it! One of the many benefits of the cloud is that new features are being added to your licensing all the time. In many ways, the value of your license appreciates over time. Unfortunately, the pace of change makes it difficult for organizations to fully understand the capabilities of the tools that they own. The Enterprise Mobility + Security (EMS) suite is no different. Microsoft’s popular solution for protecting organizations from data leakage is designed to approach security from multiple angles. In that spirit, your EMS license is a conglomerate of several security tools. We’ll dive into those different elements in this post. As mentioned above, EMS is a combination of many data security tools. These tools can be purchased individually, but purchasing as a suite results in some big cost savings. There are two licensing tiers for EMS – E3 and E5. The table below provides a high-level view of the differences. You can find more details here. Note: If you purchased EMS prior to the introduction of the E3 and E5 tiers, your licenses are the equivalent of E3. Many of you likely purchased EMS with 1 or 2 of those point solutions in mind. The price point was attractive, so it made sense to purchase the whole suite. If you’ve taken the steps to implement that first workload, it’s time to look at other ways to enhance that workload or roll out some of the other core EMS solutions. The table above provides solution names, but not a lot of detail on what each solution does or the problem it solves. So, what are you really getting with your EMS license? Keep in mind, these protections aren’t only for cloud based assets – they can be leveraged for the whole enterprise. The functions above solve the problem of data security in different ways. Leveraging single sign-on for your users simplifies the user experience while giving IT greater visibility to application activity. Risk-based conditional access allows you to dictate the circumstances under which you’ll allow access to your data and the restrictions that you want to place around that access. User and entity behavior analytics can provide insight into activity that would otherwise seem routine and multi-factor authentication can help thwart various attacks on authentication. File encryption and access policies protect files, regardless of the device they are stored on. Combined with intelligent data classification, your organization can proactively identify and protect the data that requires the strictest security measures. These products can be combined to provide a tighter security posture. Accounting for multiple threat vectors with the tools in EMS and other security suites reduces your risks of becoming the next victim of malware. Want to learn more? Interested in seeing what a comprehensive security strategy looks like? Call 630.832.0075 or email us at info@peters.com. Take Your Security Strategy to The Next Level. 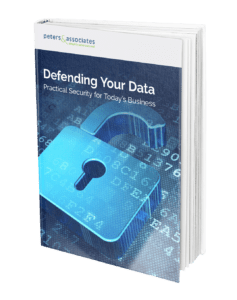 Download the Peters & Associates eBook-Defending Your Data. Learn how to Secure Your Infrastructure, and Discover How to Defend Against Today’s Evolving Security Threats. By Thomas Johnson|2018-12-18T12:14:13-05:00May 24th, 2017|Security Solutions|Comments Off on Do you own EMS? Get more out of it! As the Information Security Architect at Peters & Associates, Thomas Johnson (TJ) is responsible for providing security and compliance leadership. This includes such areas as vendor management, disaster recovery, business continuity, data protection, security products, budgeting and risk management. He has over 25 years of experience in security and technology and has extensive compliance related expertise in banking and healthcare. TJ holds many security related certifications as well as a Master’s Degree in Information Technology Management with a specialization in Information Security from the Illinois Institute of Technology in Technology. TJ focuses on Security Leadership, Risk Management, Information Security Assessments, Compliance Management and DR / BCP.